Bonnet controversy continues | What Car? Renault is to write to all MkII Clio and Clio Campus owners again, urging them to take their cars to a dealership for checks to the bonnet catch mechanism - but it still insists there is no design or construction fault with the part. The controversy has been running since April 2006, when the BBC's Watchdog programme became aware of a problem with bonnets spontaneously opening while Clio drivers were on the road. Watchdog publicised the issue in March last year, and says more than 1000 Clio owners have since contacted the show regarding the issue. It was alleged that the bonnets were opening due to a design fault with the bonnet catch mechanism, but Renault has always insisted that any problem is related to incorrect maintenance. Renault's position has been backed by the Government's Vehicle and Operator Services Agency, which has inspected the mechanism. 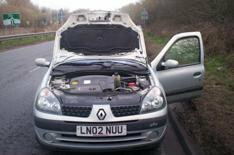 As a result, Renault refused to issue an official recall of the estimated 565,000 cars fitted with the part, but instead wrote to all registered owners of the car offering them a free check-up and a replacement catch if poor maintenance was detected. It has maintained this position despite subsequent evidence from a former employee, who claims the company was aware that the catch was poorly designed. This month, the issue was highlighted again by Watchdog, following claims that 78% of customers hadn't received the letter from Renault urging them to have the part checked, and that the Driving Standards Agency (DSA) had refused to let driving test students use MkII Clios. Renault says that the statistic relating to unreceived letters was taken by a poll on a website set up by disgruntled Clio owners, which has less than 50 members. It also says that the DSA is only treating MkII Clio the same way it would treat any car that had been recalled, by asking anyone wishing to take a test in one to provide evidence that the bonnet catch has been properly maintained. However, following these continued concerns, Renault has now undertaken to write again to MkII Clio and Clio Campus owners, this time sending letters by recorded delivery.